Losing both of her parents at once caused Emily to retreat inwards – both into herself and into her house. When the thought of leaving home becomes unbearable, she finds solace in an online board for agoraphobics, where she meets Jules, a former ad director who lives within driving distance – if it weren’t for the fact that neither of them is willing to get in the car and drive. 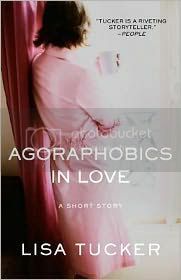 Agoraphobics in Love is a lovely short story. Tucker manages fantastic characterization and a perfect story arc in the 50 pages of her narrative. Emily and Jules are both engaging and easy to relate to, even for readers without agoraphobia. I found myself wanting more than anything for their pseudo-love affair to work out. If Tucker can do this with 50 pages, I’m very much looking forward to what she will do in a novel. Tucker’s short story – which includes the first four chapters of her new book, The Winters in Bloom – is available now as an ebook for only $0.99. Buy it from your preferred ebook retailer. Together for over a decade, Kyra and David Winter are happier than they ever thought they could be. They have a comfortable home, stable careers, and a young son, Michael, who they love more than anything. Yet because of their complicated histories, Kyra and David have always feared that this domestic bliss couldn’t last – that the life they created was destined to be disrupted. And on one perfectly ordinary summer day, it is: Michael disappears from his own backyard. The only question is whose past has finally caught up with them: David feels sure that Michael was taken by his troubled ex-wife, while Kyra believes the kidnapper must be someone from her estranged family, someone she betrayed years ago. A successful young lawyer, it seems that Quinn’s life should be perfect when her handsome, loving investment banker boyfriend Sage whisks her to Paris for the weekend to propose. Shortly after she tells him ‘yes,’ however, the doubts begin with a dream in which she feels trapped and finds herself at the altar facing three grooms, including her ex-boyfriend and her trainer from the gym. Her doubts, exacerbated by her grief of losing her father in the World Trade Center during 9/11 just a few short months earlier, lead her to be nasty to Sage and drink entirely too much, not to mention flirting too much with other men. It is time for Quinn to really consider what she wants from life, and it won’t be easy. I’m afraid you all are going to get sick of my raving about books, but here is another one that I L.O.V.E.D. loved. Quinn’s voice was just so completely authentic that I got completely caught up in her story and finished the entire 300+ page book in one weekend day, staying up far later than I had intended because I couldn’t bear to wait to complete this journey with Quinn. Some of the things she did I very much disagreed with, but I could empathize with how she arrived at every decision. Parts of the basic storyline – girl gets engaged, has doubts, boozes it up – may make “Life After Yes” sound fluffy, but Rowley brought a great deal of depth to Quinn and her storyline. I also thought that the death of Quinn’s father in 9/11 was done very well. It brought an added layer of gravity to the story, but I never felt that Rowley was using it in a way that felt manipulative of people’s 9/11 sentiments or cheapened the event. Instead it informed Quinn’s character and her actions in very believable ways. I really loved this book, and very highly recommend it. We will be discussing it with Aidan Donnelly Rowley and the rest of the SheKnows Book Club on Thursday, December 9th 8-11pm Eastern. Plenty of time to grab it and get it read, so I hope to see some of you there!